I love games like Rune Factory and Stardew Valley, and perhaps that's why I am really enjoying My Time At Portia. Even at this early stage it has a similar sense of simple, bright, pleasant charm. 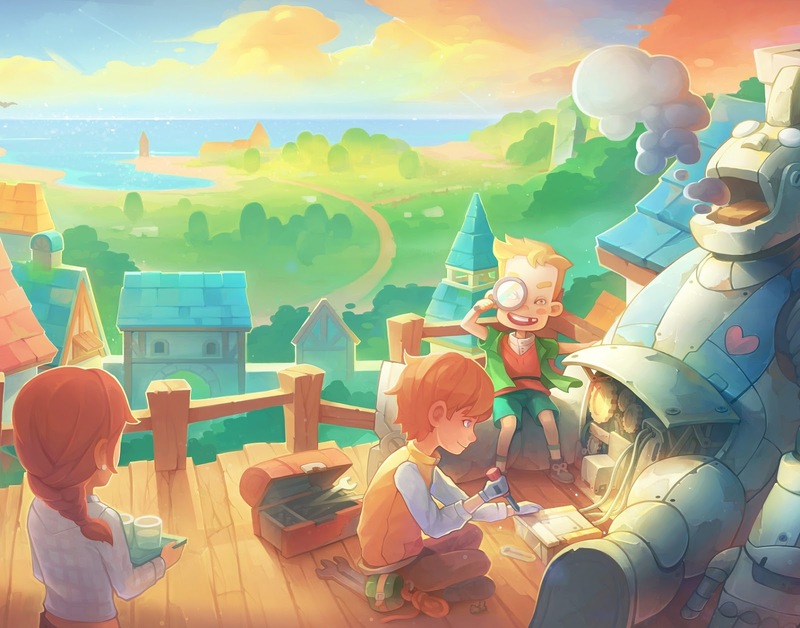 After creating a character, you learn that you have inherited a run-down workshop near a small town called Portia. It's a post-apocalypse setting but you really wouldn't guess that with the how colorful the world is. Now unlike the two games I previously mentioned, this game is not principally about farming (though you can do a bit of that). With the workshop you are tasked with building new things for the town and NPCs, and as you do you grow your shop. To build things you must have the right equipment and materials to build things, and so you must also go out in the world to gather or hunt. Materials can be easy to come by as cutting down a tree for wood or gathering rocks, right through to riskier activities like having to hunt monsters. Not all of the monsters in Portia are out to get you though; many are friendly and won't attack unless they are attacked first. An example of this is the colorful llamas that wonder in a field near your workshop. I felt bad having to hunt them for wool but I'm also a practical guy, and it had to be done. Luckily they respawn every day, so this game is cheerfully ignoring the impact of depopulation to your ultimate benefit. Another way to get materials is to mine in the abandoned dungeons. There are a few abandoned dungeons in the world of Portia that you can access for a fee of in-game money each time you enter. Once in an abandoned dungeon, you can use a pick to dig up rocks that you may need or ores by looking at the different colors on the ground to tell you what kind of ore you may get. You can also use your goggles to look for relics from the old world. Relics can be used to build some of the harder things. There are also hazardous dungeons that are full of monsters but the rewards may pay off for exploring them. Building things is easy but takes time. You pick what you want to make from a book and then an outline appears. You then must place the right amount of materials needed onto it and it adds it to what you're making. The long part is you will have to use machines like a furnace to make a bar and then turn that bar into other things with the saw and so on. All of this takes a bit of in-game time and also takes fuel. The furnace, of course, uses wood while most of the others use power stones which you can find in the mine. 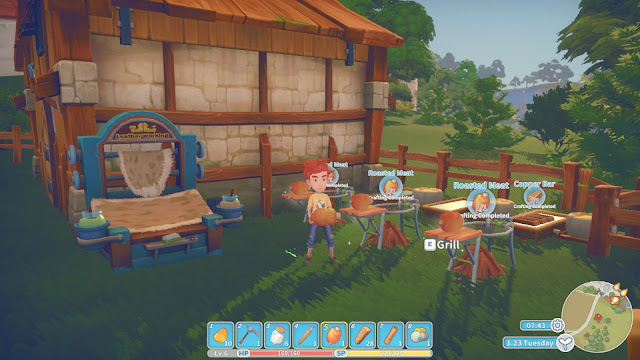 The main goal of the game is to build your workshop into the best one there is by taking on jobs and completing them in a timely fashion and beat out the other workshops around to be the best there is in Portia. This element of competitiveness also distinguishes it from games like Stardew Valley, though it's not overly intense about it. Almost everything you do in the game earns you experience points, just like in most RPGs. When you level up you can pick from a list of upgrades you want, such as raising your health and so on, just like in any other RPG out there. Now you can't just go mining all day you have a certain amount of stamina you can use each day. Almost everything you do takes a little from gathering to fighting, which is something that Harvest Moon fans will be more than used to managing. There are a ton of NP's that you can interact with and become friends with. You can talk to them, give them gifts, play rock paper scissors, and spar with them. As your friendship grows you can have romances with them that lead to marriage. Hooray for waifu! There are other activities you can do also such as fishing and even town festivals. The one festival is where they ask you to give something to drop out of a balloon. Everyone in town gives one thing and then the day of the festival everyone gathers at the town square and the balloon flies overhead dropping presents where everyone tries to run and grab it at the same time. You have to be very fast if you want to get something! Which is a nice nod to small town fares that very few people get to participate in these days in the real world. There are a few ways to earn money. One way is to do jobs by taking on the jobs at the bulletin board in town. Another is to build and then sell what you have made. The town is always busy with the townsfolk moving about, doing their jobs or playing or what not, and it really makes the town feel alive. There are several shops in town that you can buy things like furniture or food. You can use the furniture you find, buy, or make in your home to give you a small boost to your stamina or health but only so many things can be placed until the boost won't add any more but you can still place the furniture. There is so much to do in My Time At Portia that it's hard to believe this is just an alpha build of the game... and it's truly exciting to see what will come in the weeks and months ahead. I can't wait to see what the finished project is like as I really enjoyed My Time At Portia. 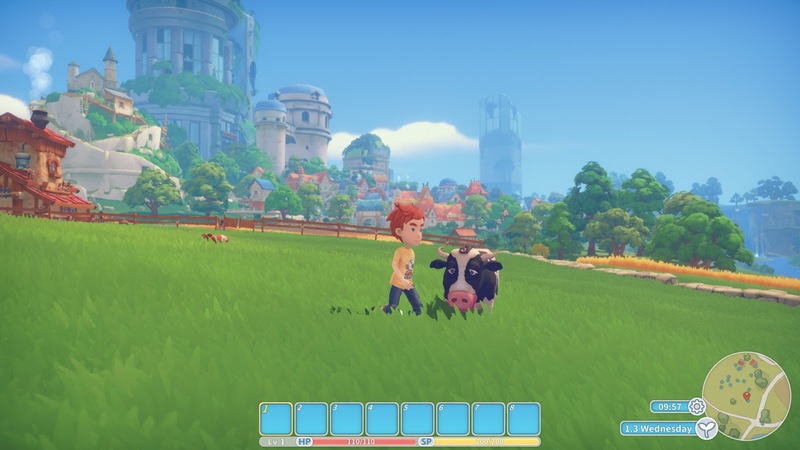 My Time At Portia will release on Steam Early Access January 23rd, 2018.